When I was illustrating the covers for NYRB's Kingsley Amis titles I drew a lot more than what ended up being used. 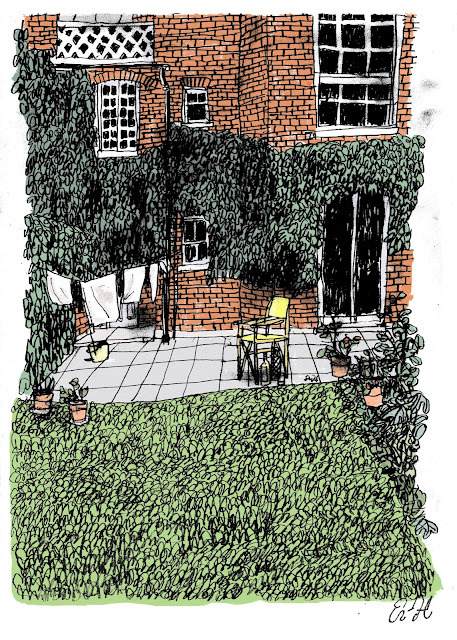 This, I believe, was for the collection of stories, but it might just as well have been meant for his novel Ending Up, because this is where Amis ended up: writing in the back garden of the house where he lived in Primrose Hill, London. A house belonging to his ex-wife (Elizabeth Jane Howard) and her new husband, a surprisingly congenial ending for a somewhat irascible character. Note the gin bottle and siphon placed next to his chair. Sara Kramer art directed this series. This is the sort of drawing which I could imagine working very nicely as a print. I wouldn't mind having it on my own wall (if my own walls weren't so filled with bookcases.) I wouldn't mind writing my late novels in such a setting.